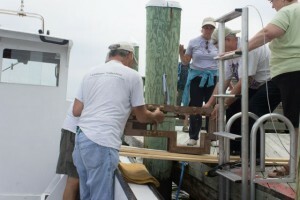 Thomas Point Special Project – Fog Bell Striker Installed – Chesapeake Chapter U.S.L.H.S. Hobie contemplates how to move the parts in very tight quarters. The Chesapeake Bay Maritime Museum was the home of three of the eight known clockwork bell machines still in existence. One is in the Point Lookout Bell Tower, one is in the Hooper Strait Lighthouse, and the third, which for a time was also in Hooper Strait, was transferred to Thomas Point Shoal. 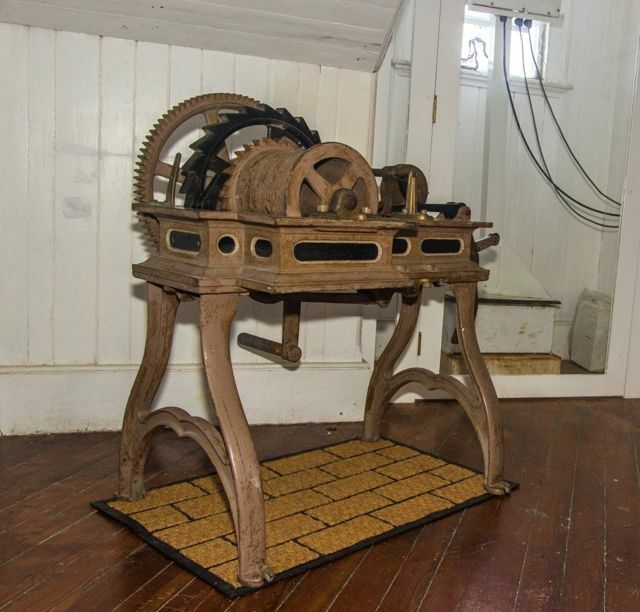 Records are not clear on whether this machine was used in Thomas Point Shoal. The CBMM volunteer who restored it talked with the Coast Guard employee who maintained bell machines from 1947 until they were automated. He said that this machine was the type used in Thomas Point Shoal. 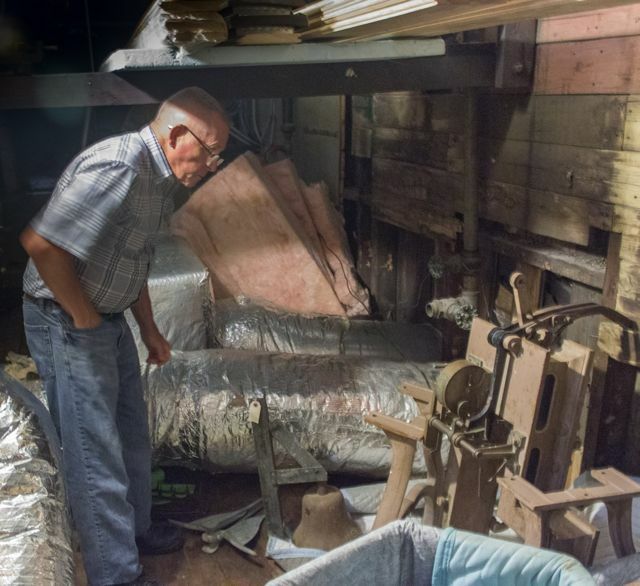 The machine was in 4 parts in the attic of the Annapolis Maritime Museum. Hobie Statzer and Tony Pasek retrieved the parts on Thursday July 17, and on Saturday July 26 a crew assembled them and placed the machine as nearly as possible to where it would have been In Thomas Point Shoal. 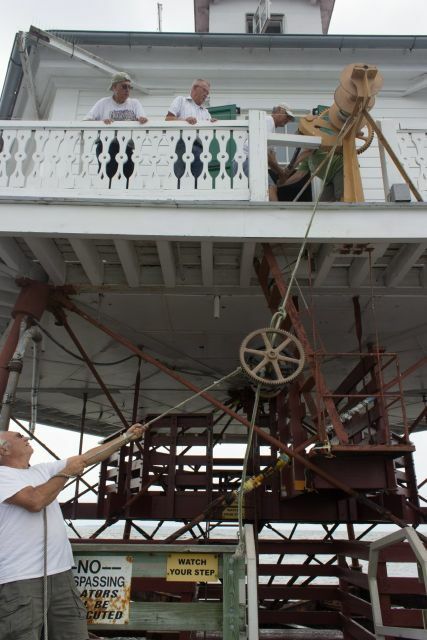 Tony and Howard pass the frame to Ray Brown on the pier. Tony and Virginia power the winch while Howard stabilizes the boat. 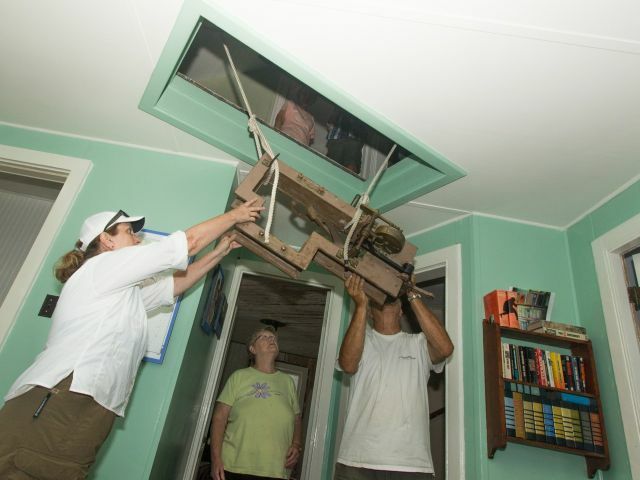 The parts are loaded thru the hatch to the second floor. 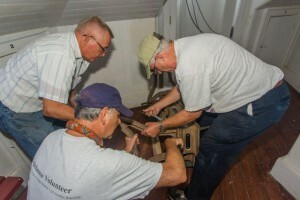 Hobie, Tony and Ray Brown fit the legs onto the frame. 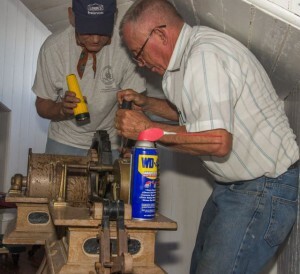 Hobie and Tony and WD-40 bolting the winder to the frame.